« Monumental Art 2013 – Where Do We Come From? What Are We? Where Are We Going? 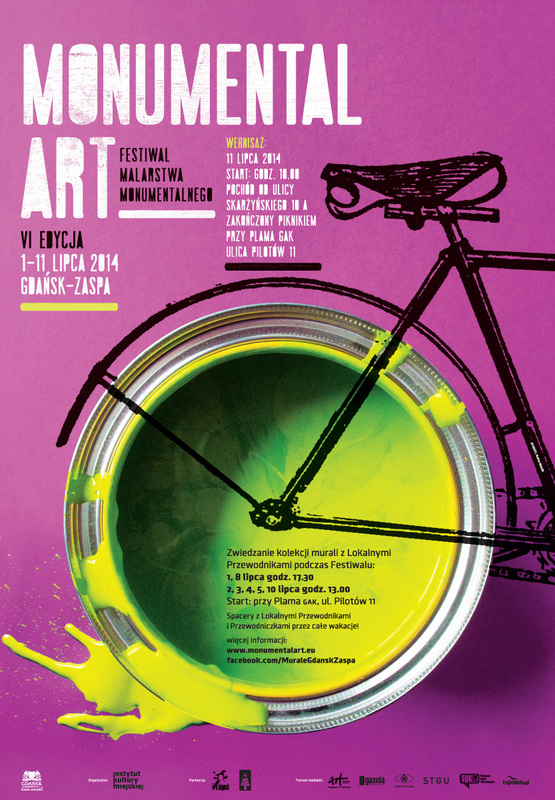 On June 30th first of the artists hit the walls and began the 6th Monumental Art Festival. The mural were made by the artist from Poland, Spain, Japan, Argentina and Italy. Their work revolves around the edition’s motto: “Road is the Happiness”. The opening took place on July 11th, 2014. The Monumental Art Festival director, Piotr Szwabe, had invited five artists to participate in this year’s edition: Gualicho from Argentina, Opiemme from Italy, Zosen Bandido Collective of Japanese and Spanish origins and Maciej Salamon from Grupa Krecha from Poland. The buildings (blocks of flats) that will serve as the space for the art are located on Skarżyńskiego St. 10A, Dywizjonu 303 St. 9D, Pilotów St. 18E and Nagórskiego St. 5C. From June 30th the artists will be working on their pieces, the official presentation of which will take place on July 11th at 6.00 PM. 6th Monumental Art Festival gave out fur murals, making the total of forty nine in the Zaspa district by the end of the event. - The colors that fall from the top of the buildings are to represent the colors that street artists bring into the urban spaces. They are to become the symbols of happiness and joy that the art is supposed to bring to the streets – says Opiemme about his mural created at Dywizjonu 303 St. Opiemme is also a poet, so his works are full of poetics aimed at the art’s accessibility in the urban environment so as to be open for the public interpretation. 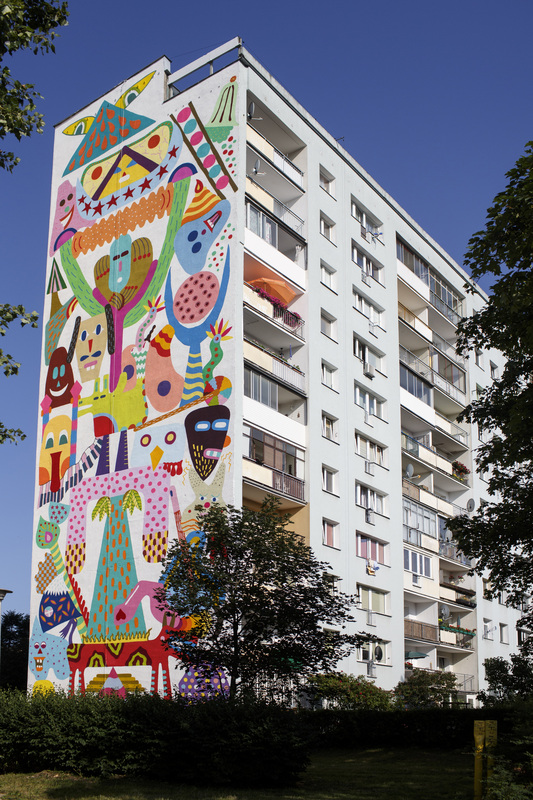 Zosen Bandido, whose mural was created at Pilotów St. aims at immersing the viewers in the imaginative colors and geometrical patterns. The artist creates their own mythology with the fantasy characters that are the commentary to the actual reality. – The road for me is my life, is the road that I share with the people. We can both find and lose people on our way. My way is the way of knowledge and experience. I am open to discover new cultures, feelings, techniques an people. The road is the happiness and the life is the miracle – says Zosen Bandido who will paint his mural with Mina Hamada from Japan. Pablo Harymbat, also known as Gualicho, creates a new world through joining the animals, plants, machines and retro-futuristic cities and dubious characters which illustrate the archetypes and conflicts in the society. – My “Eternia” mural shows the world within the world, the micro- and macro-cosmos, the eternal cycle of day and night, the birth and death, the failure and success. The breath of life is also the breath of death. Happiness is the way to reach the state of mind in which we see things exactly as they are. Living in harmony with natural cycles can eventually give us the happiness beyond of reasoning – says Gualicho. 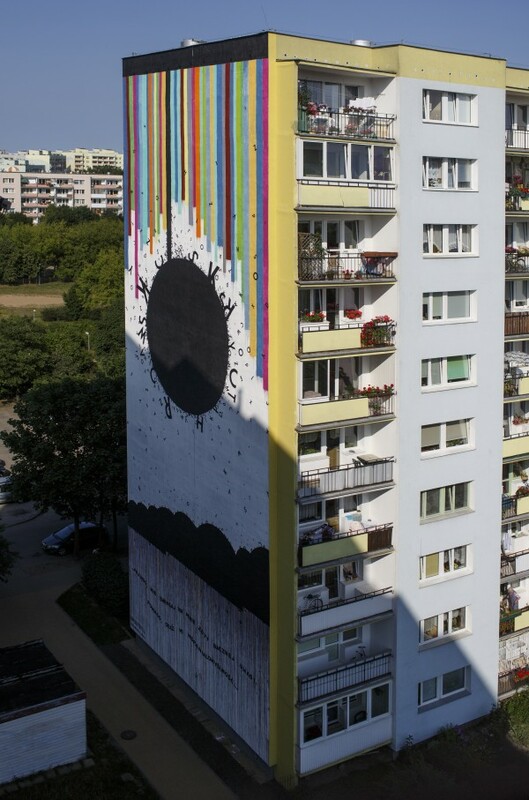 His mural will be created at Skarżyńskiego St.
Maciej Salamon, Gdańsk Academy of Fine Arts graduate paints “wherever he can”. He is also into screen printing and graphics. He is one of the founders of Grupa Krecha, and the creator of artistic installations and murals. Apart from that, he is the lead singer, lyricist and guitarist in Nagrobki band. - Road is the happiness. I keep saying that to myself whenever I am on the road. When I am tired, the train is hot and I smell some gross food from the person sitting next to me or I have to listen to someone else’s endless phone conversation – this is when I need to remind myself that road is the happiness. My mural presents the construction that allows us to embark on the journey beyond the ordinary. To forget the destination and focus on the road itself, as it can be more interesting than our aim itself. 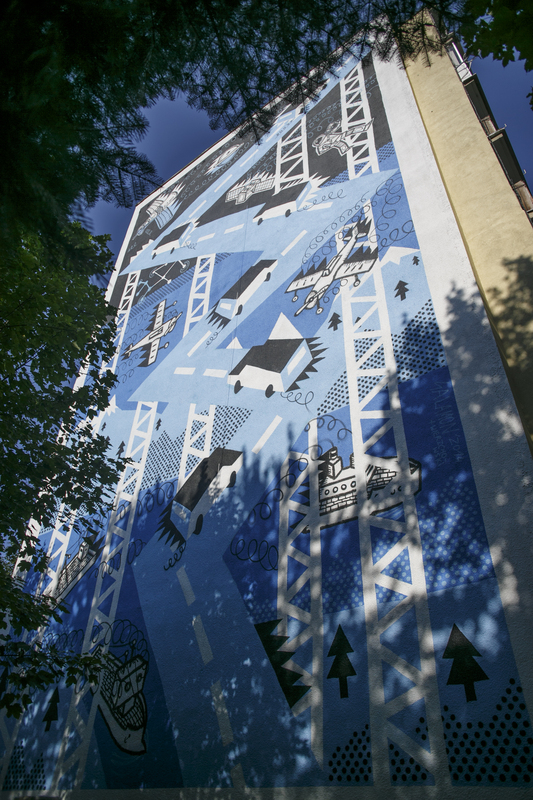 That is why I picture the road that has no end, because it is not what counts – says Maciej Salamon, whose mural will be created at Nagórskiego St.
Poland’s biggest Monumental Art Collection in the Zaspa district in Gdańsk was featured by the Huffington Post as one of the world’s 26 places with the murals worth seeing. The collection will be available since June 17th. The guided walks with the local activist who will tell you more about the history of the buildings, the artists and their creations take place 3-4 times a week. Visit http:www.muralegdanskzaspa.pl/jak-zwiedzac/ for more detailed information. 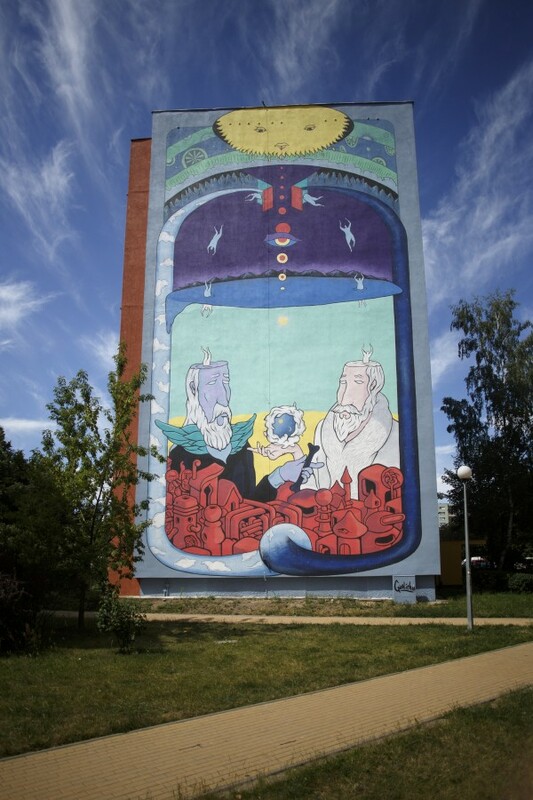 The Monumental Art Collection consists of 45 murals on different topics – famous people, history and the city of Gdańsk, love, freedom, the crisis and – this year’s creations on the road to happiness.